CALDWELL, Ohio -Â Inmates and staffÂ are playing Santa’s helper this year. 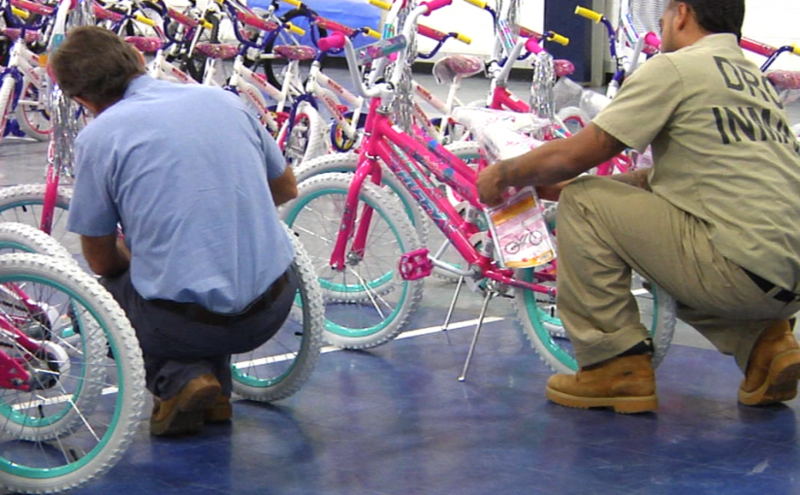 The Noble Correctional Institution partnered with a woman known as ‘The Bike Lady” to assemble and deliver bikes for children in foster care. Tim Buchanan, Warden of Noble Correctional Institution, said the partnership was very successful. “The entire assembly was taken care of by the Noble maintenance department and next week our special response team will do the delivery to the seven different county foster children’s agencies,” said Buchanan. The bikes will be distributed to child protective services in seven surrounding counties; Belmont, Guernsey, Monroe, Morgan, Muskingum, Noble and Washington. The inmates assembled the 155 donated bikes Wednesday morning and they will be delivered on December 12th. Buchanan said the program has been great for the institution. “It’s been nothing but positive, staff have been wonderful, really took great leadership, great coordination and effort. The inmates stepped up and have done a wonderful job,” said Buchanan. Joel Burris, Public Information Officer at Noble Correctional Institution, said it’s great for the staff and inmates on a different level. Burris said he had a personal connection to the program. Him and his wife areÂ licensed foster parents in the state of Ohio and have adopted their 3 foster children. “For me to have that opportunity to affect 155 foster kids’ lives is just unmeasurable. It’s just going to make my Christmas knowing that 155 kids have a bicycle coming for Christmas,” said Burris. This is the prison’s first year working with the program and Buchanan said they hope to do it again next year.